The wonderful look of this pattern stitch grows organically from the twisted cable ribbing at the lower edge. It's an easy pattern to work, and doesn't require a cable needle. This would look great in solid, variegated, or tweedy yarns. Ten sizes from XXS through 4X. Uses worsted weight yarn. Gauge is 27st and 27 rows in pattern = 4", on #7 needles. Stockinette gauge is about 5 st/inch. 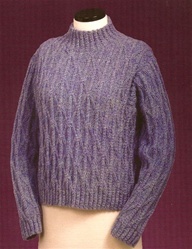 We have several wonderful yarns that would really shine in this pattern. Uses worsted weight yarn, 180-210 yds/100g.